Thanks to last year's wardrobe malfunction, everything about Sunday's Super Bowl broadcast is going to be scrubbed clean. And it looks like that will also hold true for the commercials, which will feature lots of family-friendly ads. A few spots have even been rejected for being too racy (see them below). Nothing is less effective than benign, unmemorable advertising. Why pony up the $2.4 mill if you have to play it safe? Shameless Promo: Tune in to TVGeekSpeak.com on Monday for our special Post-postgame Postgame Commercial Analysis. The Geeks will give their picks and pans for all the Super (and not-so-super) Ads. See the rejected GoDaddy.com ad here! See the rejected Budweiser ad here! Hey Lost fans... are you ready to rock? Your favorite band, Driveshaft, has their own website. I hope they find Charlie soon so they can resume the tour. Spinoff Time on Wisteria Lane? ABC wants to cash in on the success of Desperate Housewives with a spinoff. As a public service, I'd like to invite Eva Longoria over to discuss a few storyline ideas I have for her character on the new show... none of which involve clothing of any kind. David James Elliot is setting sail from the long-running JAG to develop projects at ABC. How ever will I go on? Friday: Get warmed up for the best part of the big game: the ads! Check out The Greatest Commercials: Super Bowl vs. The World on CBS. 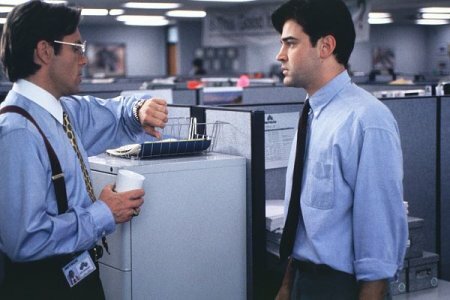 Cult classic Office Space punches in over on Bravo. And there’s no shortage of great flicks on tonight: check out Fargo on Showtime, and Seabiscuit and The Cooler, both on HBO2. Saturday: The SAG Awards are on TNT, but you don’t really want to watch that. You’d rather watch Old School (You’re my boy, blue!) for the 15th time on Cinemax . Afterwards, check out a brand new episode of the always fascinating Taxicab Confessions on HBO. Sunday: Umm… I think there’s some football game on or something. With some cartoons on afterwards. Beforehand, NBC shows a 2 hour Poker Superstars Championship, and Animal Planet has a big game of its own: the Puppy Bowl, with baby canines battling on the gridiron. Woof! This week's Friday "Eff Off" takes a patented TVGS 99 word look into the not-too-distant future, when NBC plans to pollute our airwaves with another Apprentice starring everyone's favorite jailbird. But surprise! Uncle Buster has no designs on watching this one. Not since Ray Liotta in Goodfellas has an inmate been busier behind bars. Martha Stewart Omnimedia (think omnipresent too) announced Stewart will host her own version of The Apprentice. Thankfully, they will wait until she's sprung to begin taping. That way, we're spared seeing interns make decorative shivs or keeping those prison grays smelling spring fresh. What is she going to teach an Apprentice? What's the best wrap to wear to an arraignment? How much cinnamon will hide the metallic scent of the file you've baked into that cake? Learning the ropes from a felon? Not such a "good thing". Will the new Apprentice be any good? Post your comments below! Easy one this week. 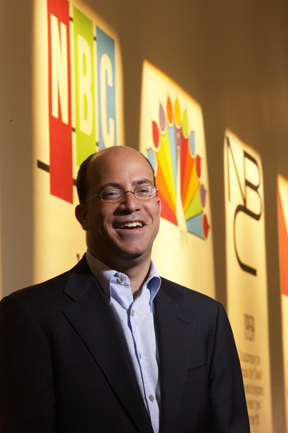 NBC's Jeff Zucker, who after years of gloating about NBC's trouncing of the competition, announces "Sweeps are becoming obsolete!" Convenient that this proclamation comes when NBC is totally in the shitter ratings-wise. Any chance that when NBC is back on the upswing, Zucker will humbly repeat this mantra and not crow about his success? Answer: d) 1-800-HOMICIDE is all sorts of fake.